Sometimes a good plate of chicken rice is exactly what you need. 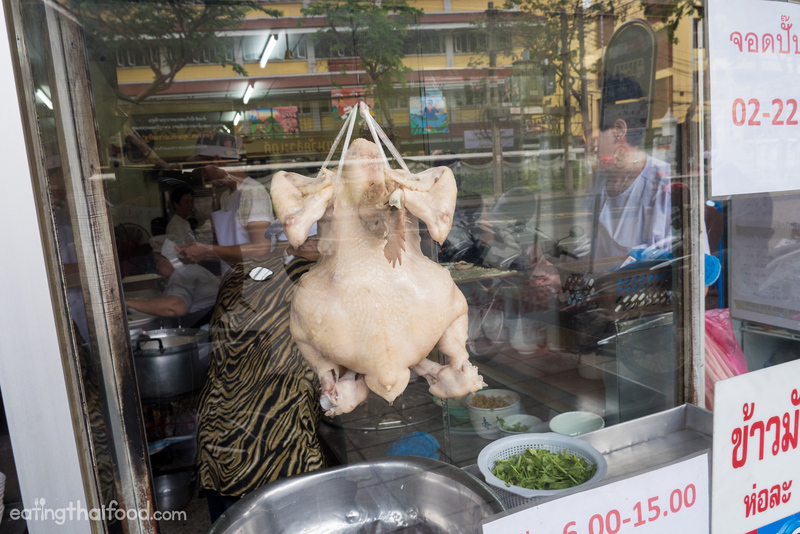 Located just across the street from the entrance of Wat Saket is Jae Yee Chicken Rice (ข้าวมันไก่เจ๊ยี), a classic Hainanese chicken rice shophouse where you’ll find plump boiled chickens and fluffy chicken oiled rice. 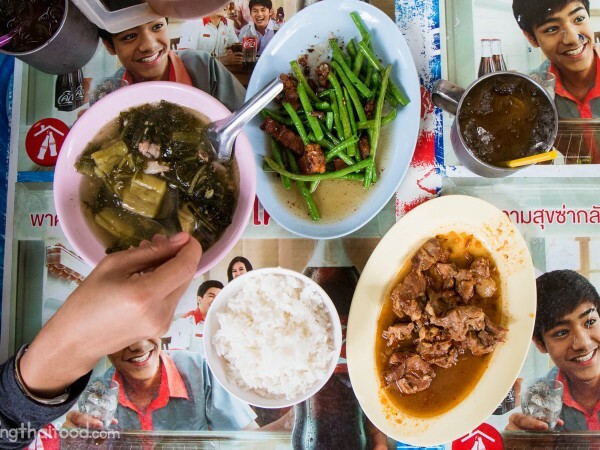 In this Thai food blog post I’ll share with you all about it. Also check out my Thai chicken rice recipe! Originally from China, and popular throughout Southeast Asia (especially famous in Singapore and also in Malaysia), chicken rice is very common in Thailand, known as khao man gai (ข้าวมันไก่). It’s not something I particularly crave all that often. But sometimes I feel like I just really want chicken rice. On this exact day, that craving for chicken rice came right after climbing to the top of Wat Saket (Golden Mount). Jae Yee Chicken Rice (ข้าวมันไก่เจ๊ยี) is a classic shophouse restaurant in Bangkok that serves chicken rice. 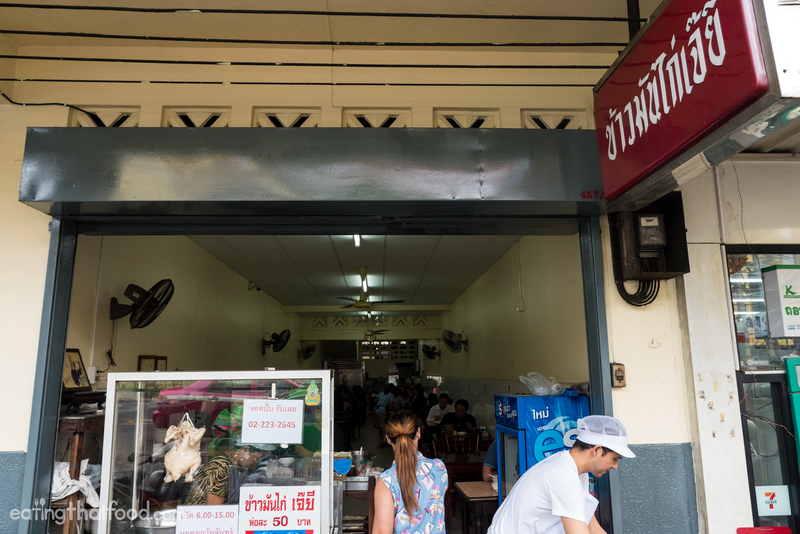 You’ll see the chickens hanging in the glass cabinet at the front of the restaurant, although when I was there they just kept one chicken hanging as they were so busy, so they had many more chickens in the back kitchen that they were chopping up to meet the lunchtime demand. The restaurant looks small from the outside, but it’s actually quite long and skinny, so there’s at least a dozen tables in the back. You go to Jae Yee Chicken Rice (ข้าวมันไก่เจ๊ยี) to eat chicken rice, and they do it well. 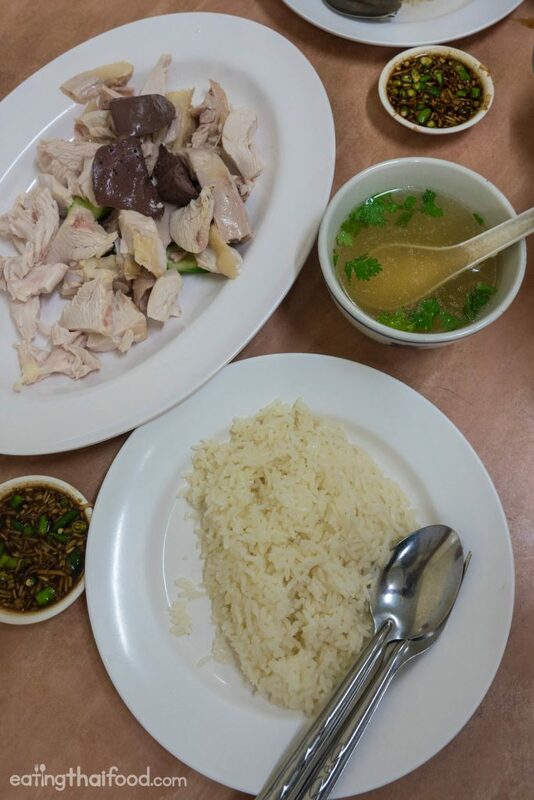 When you eat chicken rice you can either order a single plate of chicken over rice (ข้าวมันไก่ khao man gai) or you can order a full plate of chicken (ไก่ต้ม จาน) and separate plate of rice. If you want more chicken, I would recommend ordering a separate plate of chicken and rice. 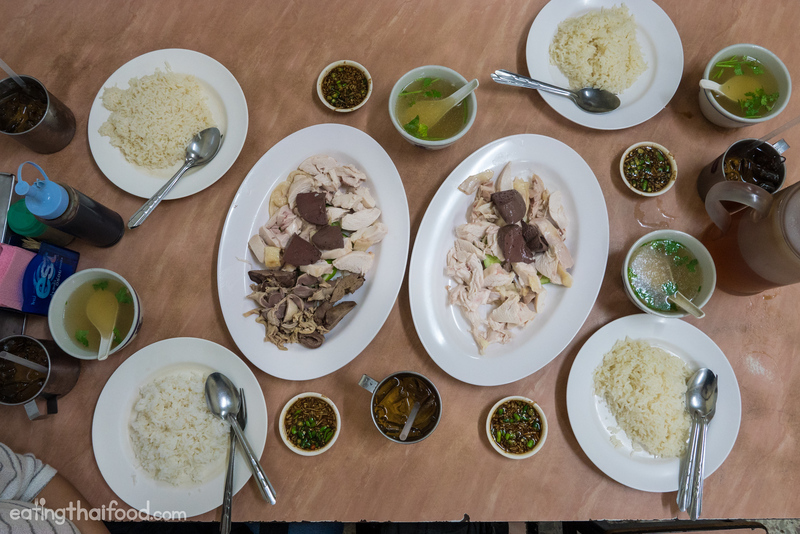 At the front of the restaurant they assemble all the plates of chicken rice, dish out the oily (but not too oily) rice, plumply juicy chicken, and assemble the bowls of sauce. 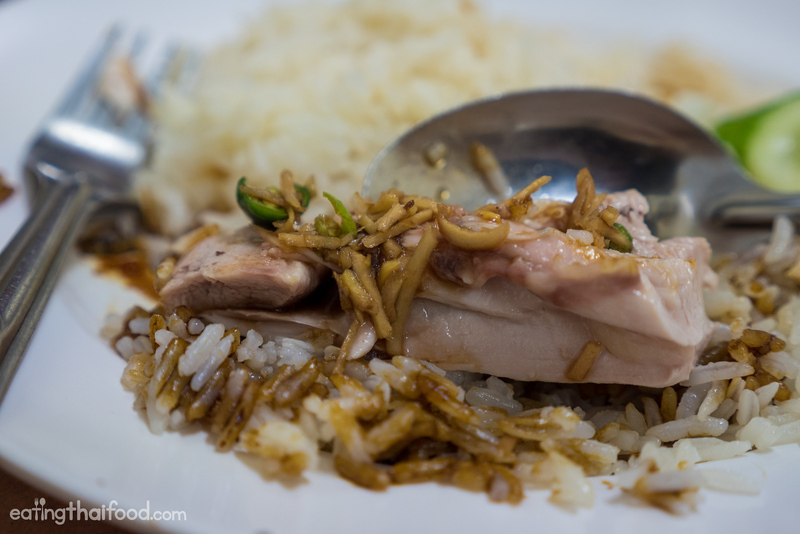 Chicken is of course one of the ultimate necessary components of any meal of chicken rice. The chicken is boiled, then typically doused in an ice water bath so it goes from hot to cold immediately, creating skin that slips off the meat while leaving the chicken firm yet soft and tender and sealing in the juices. The chicken is firm, yet incredibly juicy! 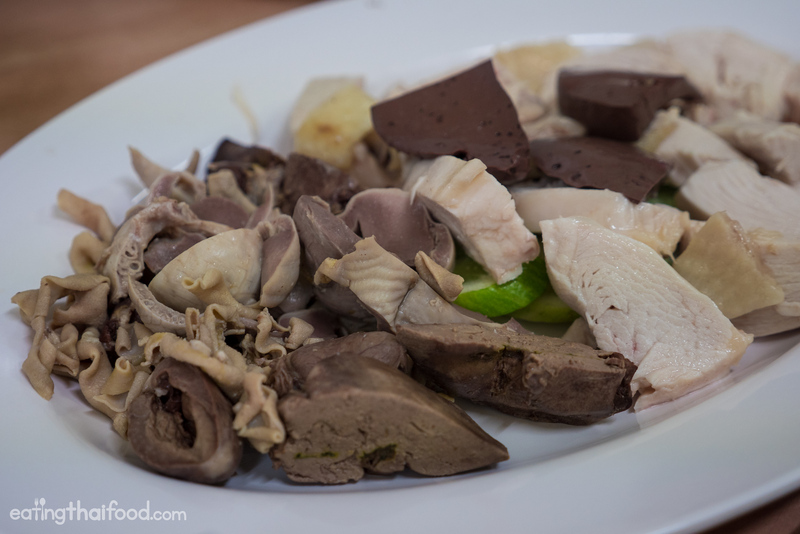 You can either order all just chicken meat, or you can order a mix of chicken meat and organs (gai tom sai kreung nai ไก่ต้มใส่เครื่องใน). We got a plate of both. Just looking from the chicken I could see how juicy it was going to be. And indeed it was. Even the white meat was not the least bit dry, but was muscular feeling while being moist and juicy. The dark meat was even more so, with a near jelly texture to it because it was so moist and oily. 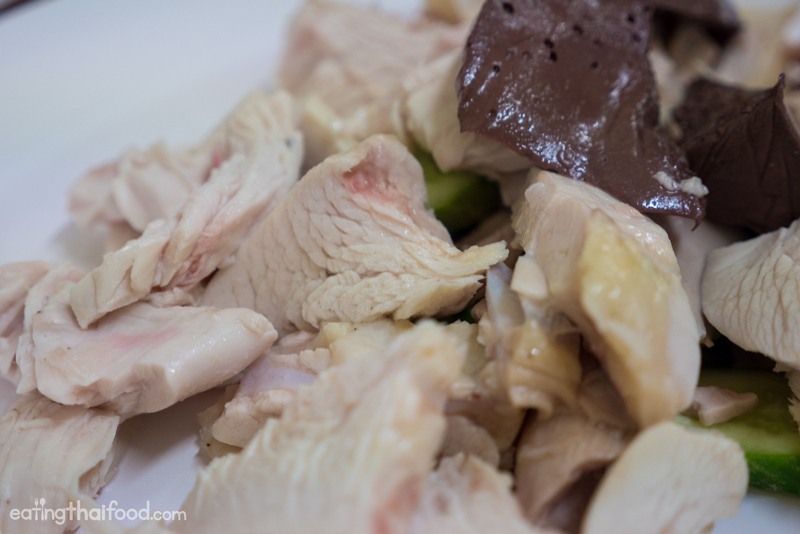 The chicken at Jae Yee Chicken Rice (ข้าวมันไก่เจ๊ยี) was some of the best boiled chickens I’ve had in a long time. I’m a also a big fan of chicken organs, especially the liver. The creamy liver was delicious as were the fork tender curly pieces of intestines. 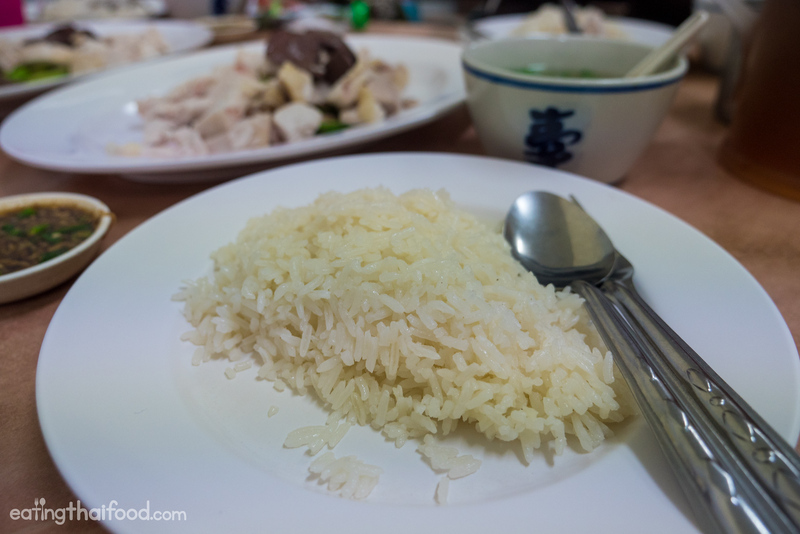 Rice is another necessary component of eating chicken rice. Sometimes the rice can be a little too oily or not flavorful enough. 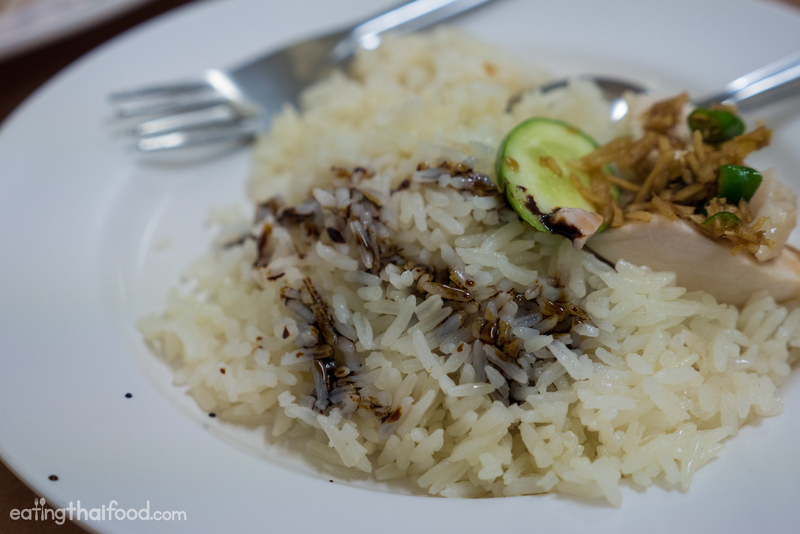 The rice at Jae Yee Chicken Rice (ข้าวมันไก่เจ๊ยี) was pretty good to me. It was oily, but not overly so, and it was slightly fluffy and fragrant with both the chicken fat broth and with a hint of a garlic flavor. 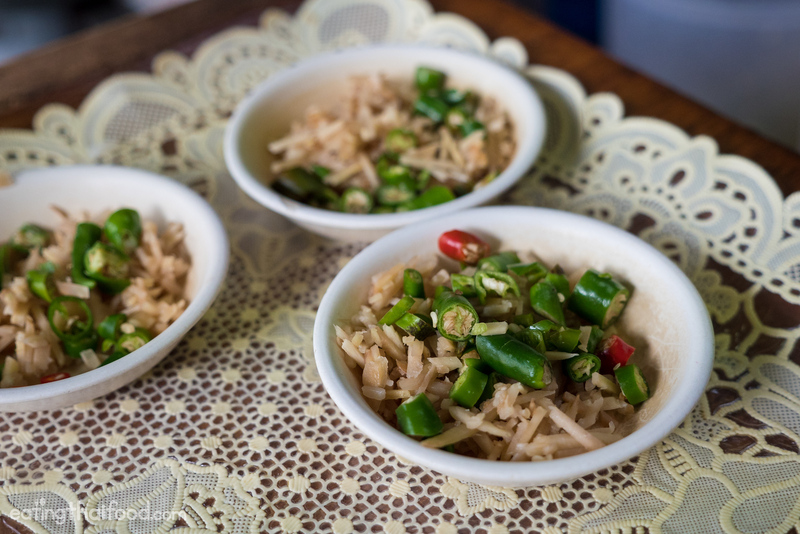 Normally most Thais, would drizzle the rice in some dark sweet soy sauce (similar to kecap manis) before eating it. I drizzled some on my rice, which I have to admit did taste pretty good. Finally, when you eat chicken rice, there’s the sauce. 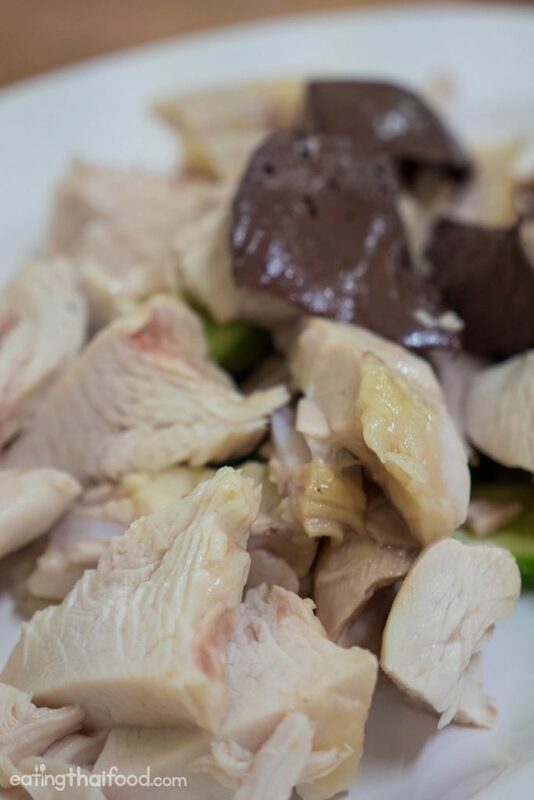 There are a number of different types of sauce that can be served with chicken rice, often having to do with what regional Chinese influence the chicken rice restaurant owners hail from. Jae Yee Chicken Rice (ข้าวมันไก่เจ๊ยี) serves a sauce that’s soy sauce based, with a sour taste and with ginger and chilies. 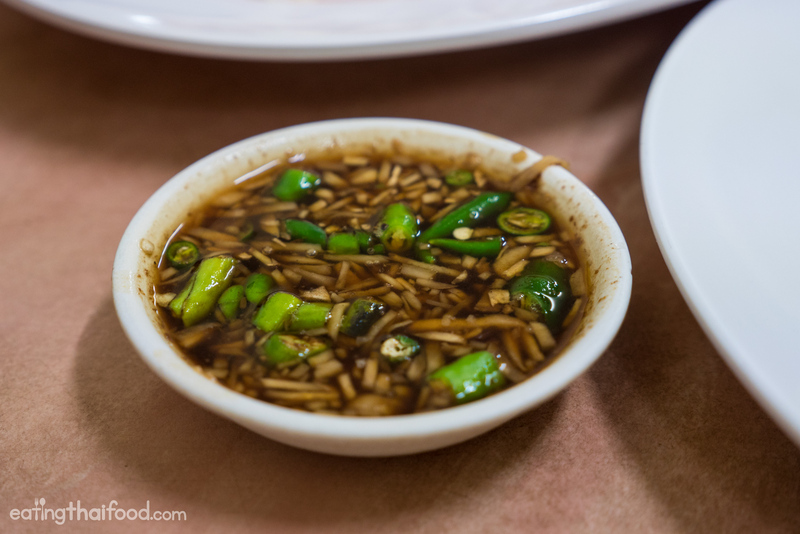 The sauce was slightly sour, sweet, and contrasted with the harshness of ginger and chilies. The sauce was good, but not spectacular — I’ve had better sauces. Also, I do like it at chicken rice restaurants like Kiat Ocha in Chiang Mai, where they give ginger and chilies on your table for you to self serve, which they didn’t here. To me, the sauce at Jae Yee Chicken Rice (ข้าวมันไก่เจ๊ยี) wasn’t anything special, but both the chicken and the rice were excellent. 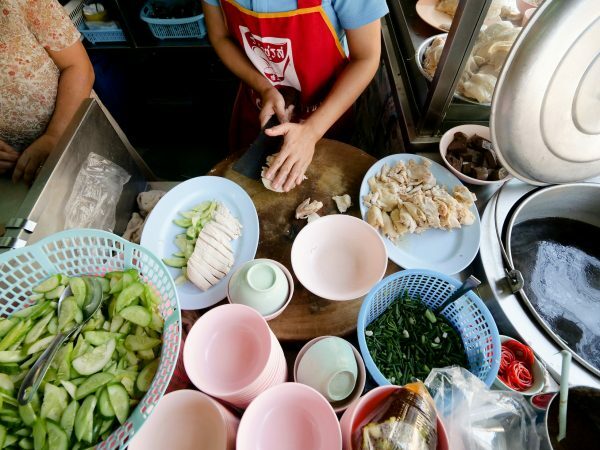 There are hundreds, if not thousands of chicken rice restaurants and street food stalls throughout Bangkok. Jae Yee Chicken Rice (ข้าวมันไก่เจ๊ยี) is a good shophouse restaurant to go if you’re looking for a good Thai plate of chicken rice that has a more quality taste than an average street food plate of khao man gai(ข้าวมันไก่). Jae Yee Chicken Rice (ข้าวมันไก่เจ๊ยี) is a chicken rice shophouse restaurant located across the street from Wat Saket in the Phra Nakhon district of Bangkok. Their chicken is incredibly plump and juicy, and their rice is fluffy and fragrant. The sauce, with ginger and chillies, is alright, but the chicken and rice is what really stands out. If you’re in Phra Nakhon, around Wat Saket, and craving some chicken rice, Jae Yee Chicken Rice (ข้าวมันไก่เจ๊ยี) is a good place to eat. How to get there: Jae Yee Chicken Rice (ข้าวมันไก่เจ๊ยี) is located along Thanon Chakkraphatdi Phong (which is the same road as Worachak), across from the driveway to Wat Saket. 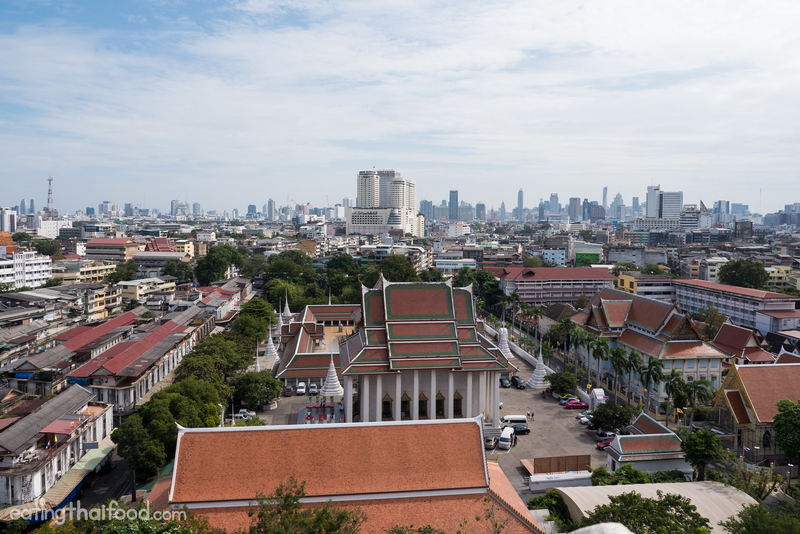 You can walk from the Phra Nakhon or Banglamphu areas of Bangkok, otherwise it will probably be best to get here by private taxi. Alternatively, from Siam, you can take the Khlong Saen Saeb canal boat to Phanfa pier and walk from there. Looks good as usual, Mark. I’ve had this in some food court in Bangkok but I guess the old restaurants make it much better. 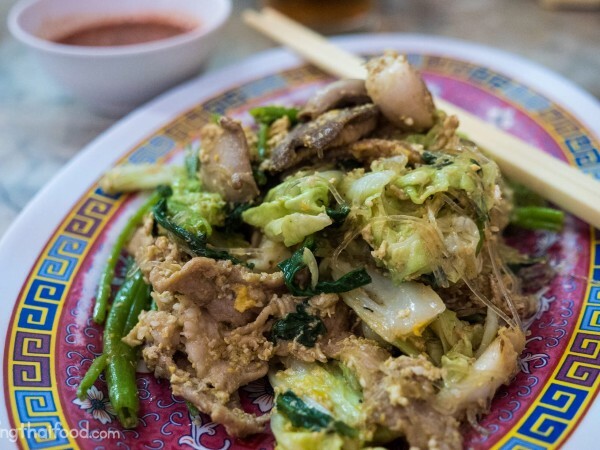 So if you just say Khao Man Gai, you will get a plate of chicken over rice? And if you want a full plate with rice separately?